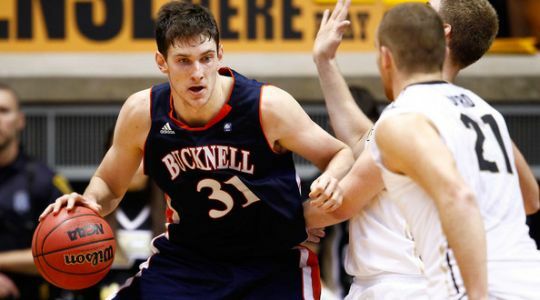 Bucknell (25-5, 12-2) – Bucknell spent the non-conference portion of their season flirting with an automatic bid, but their run through league play was not dominant enough to keep them in that discussion. They have simply not looked as good since they nearly beat Missouri in January (more on that below), but they are still the favorite to win the tournament. In addition to Muscala, they have a strong cast with seniors Bryson Johnson and Joe Willman, also in the 1,000 point club. Johnson set the conference record for most three-pointers made in a career and Cameron Ayers joined him at better than 41 percent from beyond. Lafayette (17-14, 10-4) — As I wrote at length above, the Leopards turned around an ugly start to the season and climbed all the way to the second seed in the conference. Hinrichs led the team with 14.9 points per game, with Dan Trist and Johnson sitting just under 13. Looking at just conference games, the Leopards led the Patriot League in field goal percentage (46.1) and turnover margin (+4.3 per game) which makes for a nice recipe to play good, consistent basketball. Lafayette was swept in the season series against Army, but something tells me they’d still be pretty pleased if the Black Knights took down Bucknell in the opposite semifinal. Lehigh (20-8, 10-4) – The Mountain Hawks entered this season with unprecedented expectations, thanks to last year’s upset of Duke and McCollum’s decision to hold off on the NBA and return for a senior year. When McCollum ended up on the preseason All-American team, and Lehigh even received a vote in the Preseason AP Poll, Lehigh was officially in unchartered territory. While the team has held up and played well without McCollum, their ceiling simply isn’t as high without their future first-round NBA draft pick. But the Mountain Hawks are 12th in the nation in three-point shooting, and they can beat anybody if Mackey McKnight, BJ Bailey and Greiner get on a roll. Army (15-14, 8-6) – As highlighted above, Army has played this entire year with freshmen logging significant minutes and critical roles. Spiker even went with the all-plebe starting lineup in February. But the Black Knights weren’t exactly punting this season for the sake of gaining experience. In one stretch, Dylan Cox, Wilson and Kyle Toth became the Patriot League’s first ever trio of teammates to win official Rookie of the Week honors in consecutive weeks. The Black Knights enter the postseason above .500 for the first time since the 1984-85 season. Ellis had an up and down year, but on his best days he’s the Patriot League’s best pure scorer this side of CJ McCollum. He reached 30 points four times this season, including three of his final four games. He’s a senior whose terrific career has often been overshadowed by McCollum and Muscala, so it was nice to see him recognized as a unanimous All-Patriot League team member. American (10-19, 5-9) – The Eagles are more accustomed to being in the top half of the league standings, and will open the Patriot League Tournament as the lower seeded team for the first time since entering the league in 2001. Amazingly, the Eagles are a perfect 11-0 in the first round of the tournament, but that streak will be put to the test at Army. The Eagles went just 3-13 away from Bender Arena, with their most recent win (and only conference win) January 12 at Colgate. Stephen Lumpkins led the team with 14.3 points per game and was second in the conference with 9.5 boards. John Schoof made 70 of his 137 three-pointers, and his 51.1 percent mark currently leads the nation. The Eagles rely heavily on their core starters, with Daniel Munoz, Schoof and Lumpkins finishing first, second and third in the conference in minutes per game. Colgate (11-20, 5-9) – The Raiders had an inconsistent season, which featured thrilling wins over Army and Lehigh, but also losses of 15 points or more to American, Holy Cross and New Jersey Institute of Technology. Just like American, Colgate went 1-6 on the road in-conference. Murphy Burnatowski was third in the conference with 17.2 points per game, and chipped in 5.1 rebounds. Pat Moore was second on the team with 10.0 points per game, but the Raiders struggled all year to find a consistent number two option behind Burnatowski. Colgate tied Lafayette for most points allowed per game, which left them last in the league in scoring margin (-6.1 per game). The Raiders also finished last in the conference in turnover margin (-3.2 per game). Holy Cross (12-17, 4-10) – The Crusaders underachieved this year, and offense was a large part of the issue. Our resident Holy Cross expert Kevin Doyle noted in his season preview that coach Milan Brown wanted to start pushing the ball up the floor more often on offense. The thought was that he’d be better able to deploy his system in his third year at the helm. But according to kenpom.com, Holy Cross’s average tempo (based on possessions per game) dropped from 158th in the nation last season to 290th (out of 347) this year. Dave Dudzinski had a strong season individually, finishing fourth in the conference in both points (15.0 per game) and rebounds (6.6), but had little help. It was strange to see a team that led the conference in free throw shooting (75.7 percent) struggle so much from the field (41.7 percent), but that is largely because they couldn’t generate good chances. Navy (8-22, 2-12) – The Mids’ is truly a story of two seasons. Navy entered the season with almost no expectations, after going 3-26 and winless in conference play last season. But this team of underclassmen, led by their freshman point guard Dunbar, shot out to a 6-6 start (with three of the losses by two points or in overtime). Things started to unravel in December, when a six-game losing streak crept into the start of league play. But with a 59-50 win in the first installment of the great Army-Navy rivalry, the long skid of conference losses was finally over. Although Navy appeared to be much improved, they quickly returned to their losing ways, finishing out the conference slate with just one more win over American. Navy landed in the basement of the Patriot League, but this should still be seen as a year of growth and improvement. Second-year coach Ed DeChellis will return his players next year, with a manageable goal of climbing into the middle of the pack. Quarterfinals (March 6): The top four teams in the conference separated themselves fairly early in the year, and I don’t expect any of them to go down at home in the first round. Even the 4/5 matchup would be considered a pretty sizeable upset, as American lost four straight games to end the season. The Eagles went 1-7 against the top four seeds in the tournament, with their only win against Lafayette before the Leopards started clicking. I predict a win for Army, which would be their first in the Patriot League Tournament since 2009, also the last time they started with a home game. Three of these four matchups resulted in series sweeps during the regular season, while Lehigh and Colgate split. The Mountain Hawks won by 15 at home and then lost the rematch by four on the road. In that game, they erased a 22 point deficit, but then ran out of steam late. Bucknell won both regular season matchups with Navy by at least 15 points. Lafayette beat Holy Cross by 10 at home, but the Crusaders did keep the game to within three in Worcester. That was one of the games in which Tony Johnson hit the game-winning shot in the final seconds. 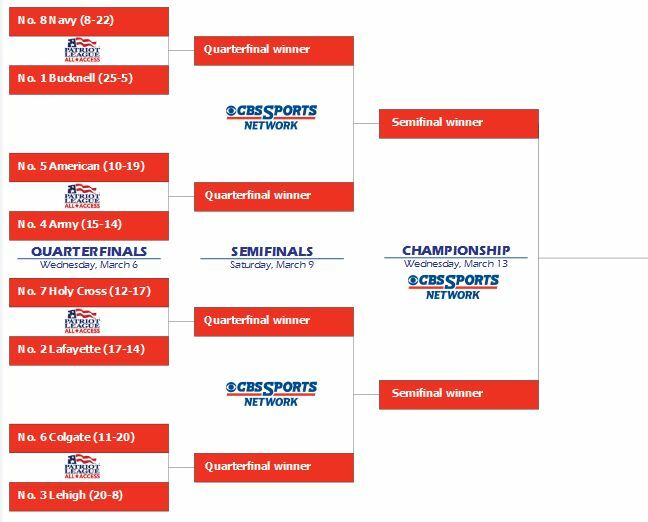 Semifinals (March 9, CBS Sports Network): If the top seeds all prevail, the semifinals would put Army at Bucknell and Lehigh at Lafayette. Bucknell and Lafayette would both have home games against opponents they swept in the regular season. Army has had a terrific run, but I don’t think they can match up against the Bison. The Black Knights will be throwing four plebes on the court and asking them to deal with four members of Bucknell’s 1,000 point club. The advantage in talent and experience is enough to propel the Bison into the final—and as I’ve been saying for the last few weeks, avoiding Lehigh and Lafayette in the semifinal is as valuable a reward as home court advantage in the final. But Army has had a great season and they should be one of the favorites in the conference over the next few years… Lafayette and Lehigh are two hungry teams that both rightfully believe they can upset Bucknell in the final. These two campuses are located just 12 miles apart, and the rivalry has a great chance to end up as the most exciting game of the tournament. Not only are the Leopards hot right now, but they had Lehigh’s number during the regular season. Both games saw the Mountain Hawks open up cold and then the Leopards overwhelmed them and ran away with double-digit advantage after the break. When the three-pointers aren’t falling is when the Mountain Hawks miss McCollum most. It often feels like McKnight could be the guy to drive to the hoop and get a tough bucket, but he’ll have his hands full dealing with Johnson all day. My friends from Lehigh will hate me for this, and I might not be invited to the next alumni reunion, but I expect Lehigh’s season to end at the hands of their archrival. Finals (March 13, CBS Sports Network): I tried to look for reasons why Lafayette—or even Lehigh for that matter—could upset Bucknell in the final, and they are there. For starters, both teams have already beaten Bucknell this year, with Lehigh even doing it in Sojka Pavilion. Bucknell’s greatest weakness is at point guard, and they could struggle against either of the top two point guards in the conference, Lafayette’s Johnson or Lehigh’s McKnight. But the smart money is still on Bucknell to win the tournament. The Bison looked great in the non-conference portion of their schedule, and came seconds away from upsetting Missouri in Columbia. While they haven’t dominated their conference schedule, they did manage to go 12-2. In a sense, it’s hard to blame them. They showed early in the season that they could rise to the occasion against tough competition, and then they had to come back and run through a Patriot League schedule they were expected to bulldoze. They were upset twice and played a couple games closer than they would have liked, but at the end of the day they are the best team. With the stakes once again elevated, I expect Bucknell to summon their best effort, which is enough to win this tournament. So there’s my big, bold preview, in which I tell you why all the home teams and favorites should win. But the thing we all love about March is that I’m bound to be wrong about something. Player of the Year: Mike Muscala, Bucknell. The battle between McCollum and Mike Muscala for Patriot League Player of the Year would have been one of the more interesting debates in the country, but McCollum’s injury made this a one-horse race. Muscala dominated Patriot League competition and even turned himself into a legitimate NBA prospect in the process. He led the conference in points (19.1), rebounds (11.0) and blocks (2.5) as Bucknell racked up a 25-5 (11-2) season. He joined McCollum and two others as the fourth player in league history to win this award twice. He was also recognized as the conference’s Defensive Player of the Year and Scholar-Athlete of the Year, making him the only player ever to win all three awards. He is also a finalist for the Naismith Player of the Year Award, and the Lou Henson Mid-Major Player of the Year awards. Coach of the Year: Fran O’Hanlon, Lafayette. This was an incredibly tight race, and any of four coaches could have made legitimate claims on this award. The league gave its official award to Zach Spiker, who led Army to its first ever winning season in Patriot League play, despite starting a lineup of four and occasionally five freshmen. Meanwhile, Reed did a fantastic job guiding Lehigh to a 10-4 conference record after McCollum was hurt. Oh, and all Dave Paulsen did at Bucknell was go 25-5 (12-2) with wins over teams from the Big Ten, CAA and WAC. 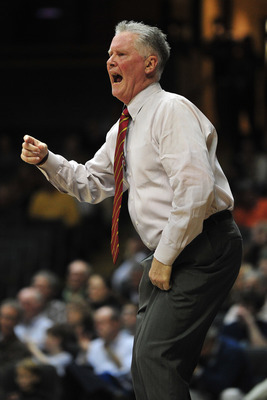 But I’ll throw my support behind Fran O’Hanlon, the longest-tenured and winningest coach in Patriot League history. O’Hanlon helped turn Lafayette’s season around and guided them to a very unexpected two seed in the conference tournament. I listed some of Army’s accomplishments above, and Kyle Wilson was a major catalyst in their season. All the way back on November 30, I wrote, “The freshman from Mission Viejo, California, has averaged 13 points in just 22 minutes per game off the bench, and captured consecutive Patriot League Rookie of the Week honors. At some point he may force Head Coach Zach Spiker to put him in the starting lineup.” It didn’t take much longer, and Wilson played more than 30 minutes in nine of Army’s final 11 games. He averaged 13.9 points in conference play and shot better than 40 percent from three-point range. His play, and the team’s success, were enough to give him the edge over Navy’s Tilman Dunbar, who led the conference with 5.0 assists per game. Ella Ellis, Sr., Army*(18.0 PPG, 3.7 RPG, 84.7% FT, 41.1% 3FG)—I left Ellis off my mid-season All-Patriot League team due to an inconsistent start—and later the senior was even briefly removed from the starting lineup. But he had a strong finish to the year, finishing second in the conference in scoring for a competitive Army squad. Holden Greiner, Sr., Lehigh*(13.2 PPG, 6.7 RPG, 1.3 SPG, 42.9% 3FG)—Greiner was the player who most elevated his game to make up for the lost production after CJ McCollum’s injury. With increased opportunities, his scoring average jumped to 14.7 points per game in conference play, good for fourth in the league. He and Gabe Knutson provided the senior leadership to make sure the ship didn’t go down with McCollum. Seth Hinrichs, So., Lafayette (14.5 PPG, 5.0 RPG, 45.1% 3FG)—Hinrichs landed on the league’s official second-team, but I thought the sophomore guard took a big leap this season and earned a spot on the varsity club. He was fifth in scoring, third in three-pointers made and second in three-point shooting. Tony Johnson, Sr., Lafayette* (12.8 PPG, 4.8 APG, 2.0 SPG, 55.7 FG%)—Johnson established himself as the top point guard in the conference, orchestrating a balanced Lafayette offense that exceeded expectations over the league schedule. He also stocked his personal highlight reel with game-winning shots in the final seconds of consecutive games against Bucknell and Holy Cross. Mike Muscala, Sr., Bucknell*(19.1 PPG, 11.0 RPG, 2.5 BPG, 52.3% 3FG)— Muscala is just the second player ever to make the All-Patriot League Team four times, leaving his mark as one of the best players in the history of the Patriot League. This entry was posted on Wednesday, March 6th, 2013 at 1:59 pm by Brian Goodman	and is filed under 2013 conference tournaments, checking in on, microsites, other 26. Tagged: american, army, bj bailey, brett reed, bucknell, cj mccollum, colgate, daniel munoz, dave dudzinksi, dave paulsen, dylan cox, ed dechellis, ella ellis, fran o'hanlon, holden greiner, holy cross, john schoof, kyle toth, kyle wilson, lafayette, lehigh, mackey mcknight, mike muscala, milan brown, murphy burnatowski, navy, pat moore, seth hinrichs, stephen lumpkins, tilman dunbar, tony johnson, zach spiker. You can follow any responses to this entry through the RSS 2.0 feed. You can leave a response, or trackback from your own site.